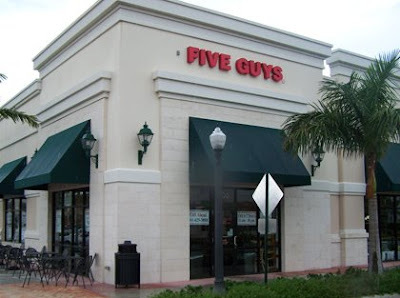 I was extremely excited to see that they are building a FIVE GUYS burger and fries on Eagle road--the sign said that it is scheduled to open this summer! The last time I was back in the DC area my BIL Nathan and his wife Erin took me to eat at one and it was SOOOOOOOO good!! Once it's open go and get a burger you will be very glad you did!!! Oh man, so good. I'm glad you can enjoy it's greatness more often now. Is it really that good??? I saw the sign for it...but have never been... PS we live down the street from you... we really should hang out some time!!! Did you hear Obama went there for lunch the other day...not sure if that diminishes my love for 5 guys or not...nope, I'm still good.